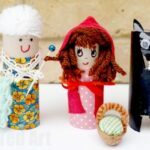 I have challenged the kids and myself to work with cardboard tubes again more – yes, the humble toilet paper roll, is such a great (virtually free) and versatile craft material it would seem rude not to! Much to my dismay the UK have started manufacturing NARROW tubes. Can you believe it?! I guess it is good for the environment and we should applaud that. But it does mean, that our crafts are changing slightly.. sigh. I ramble and digress. 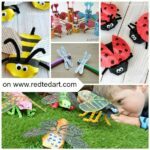 I wanted to share our Toilet Paper Roll Minibeast Craft with you today! 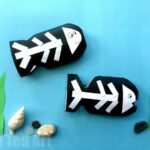 The idea was inspired via Red Ted’s teacher – she wanted me to come into class next month and make some with the kids. So I had a brainstorm and then clearly we had to try these Toilet Paper Roll Bugs out first. 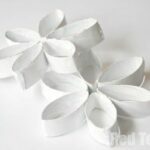 If you are looking for ideas for what to make with Empty Toilet Paper Rolls.. this is the Spring or Summer craft for you! 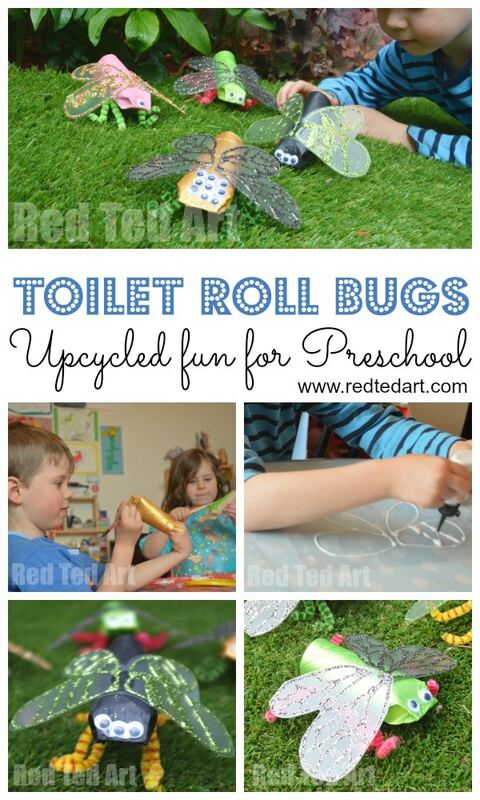 Our Toilet Paper Roll Mini Beasts shared in May 2013, updated and republished for you today!! The version here today, is DIFFERENT to the class version, as you need to think more pragmatic about the drying times etc. But I will indicate the differences as we go along! 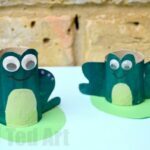 1) To make our Minibeasts craft, we decided to shape the front of our TP Roll, just to make it a bit more interesting and then taped it down with masking tape – masking tape can be painted over easily. You could glue it down too and hold it place with pegs. (Follow the sequence of the 4 loo rolls above). 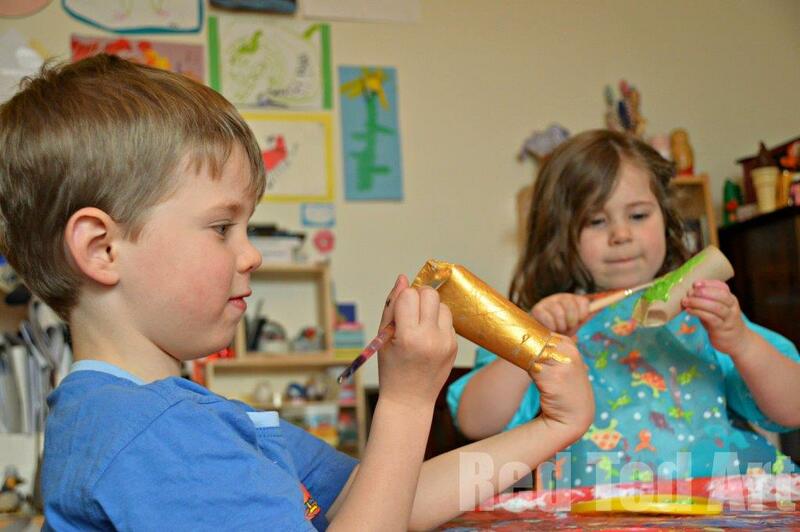 2) The kids got painting their bugs in different colours. We do prefer acrylics as they stand out better, but try the paints you have at home and see what works for you! Or wrap them in paper and colour it in with a pencil. 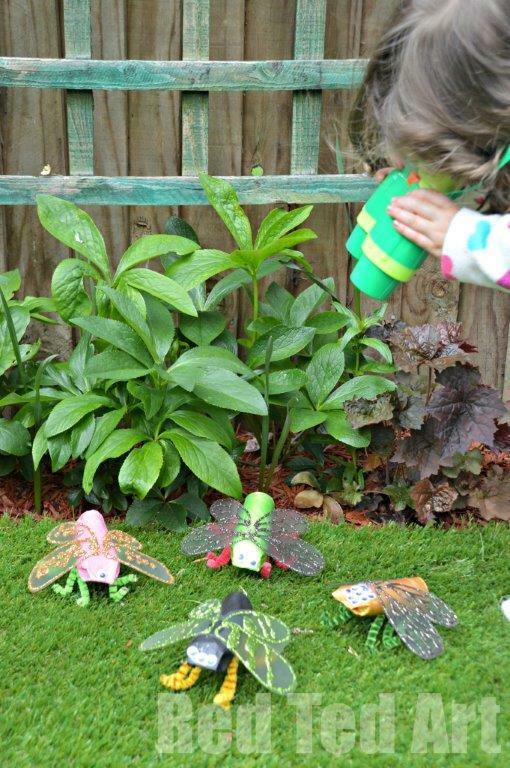 Time for the fabulous Minibeast’s wings! 3) Whilst the minibeasts were drying we set to work on the wings. I drew some wings onto paper. Using a glue with a fine nozzle, we the traced the wings with the glue. I met a set for the kids (they asked me too) and then they made their own set. It was great for them to have a go at using the glue and learn about “controlling it”. 4) Cover in glitter… and then shake the excess glitter off, onto a sheet of paper to pour bag into your glitter container (see our Tinkerbell wings for more photos). If you are doing these in class.. do not use the glitter/ glue approach, but colour your wings with sharpies. I think they will look just as fun! 5) Whilst they are drying and if your Toilet Paper Rolls are ready – get your pipe cleaners. We used 1.5 standard length pipe cleaner per minibeast. We cut 3 pieces and then poked them through the Toilet Paper Roll – leaving the ends hanging out to make 6 legs for the minibeasts. The kids did need help – it was a little fiddly and I am think about what the best approach for class will be (I wonder if 6 legs are better, glued into the sides of the mini beasts? I shall see). 6) Finally – add googly eyes (1 – 100!) and glue on your wings. We actually used my hot glue gun, as it dries clear. I have noticed that PVA (or white glue), stays white against the acetate (must be because it doesn’t try fully?). This was fine on Tinkerbell, as it was on her “back”, but the Mini Beasts, I didn’t want the white showing. I don’t think it really is a problem if you do use PVA. Just be warned that it will “show”. If you don’t have a hot glue gun you may want to tape them on. Done. 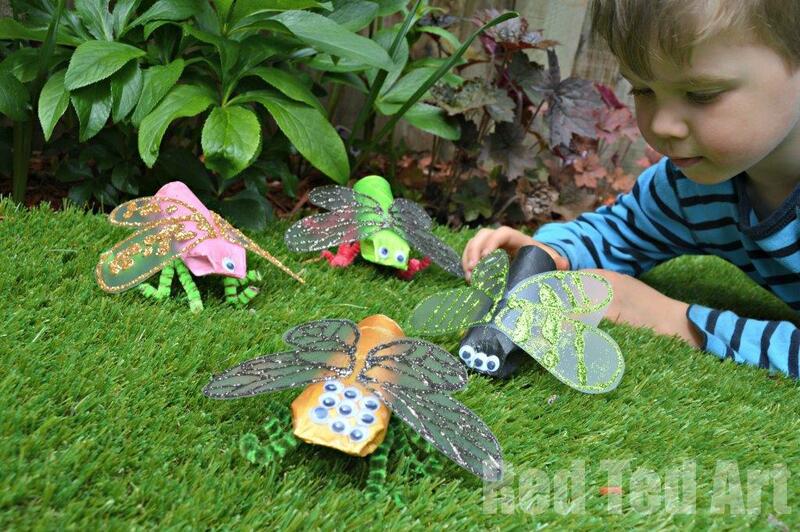 Go on a bug hunt! 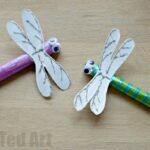 Teehee, we arther adore our Toilet Paper Roll Bugs!! Aren’t they just super fun! UPDATE: 2-3 weeks later, we went into school and made this collection of Toilet Paper Roll Bugs in Red Ted’s class. I prepped the loo rolls as per the above to give the mini beast shape. The kids then painted them on the second day. On the third day we added pipecleaner legs, eyes and wings. The legs were easier to cut into 6 (rather than 3) and glued in each individually (we found threading them through as we did with ours in such volume a but fiddly). Instead of glitter (which would have to dry too long) the kids got to use my rainbow permanent marker pens. They did such a lovely job!! 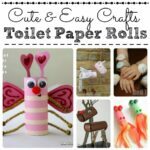 What other fabulous Toilet Paper Roll Crafts can you make? 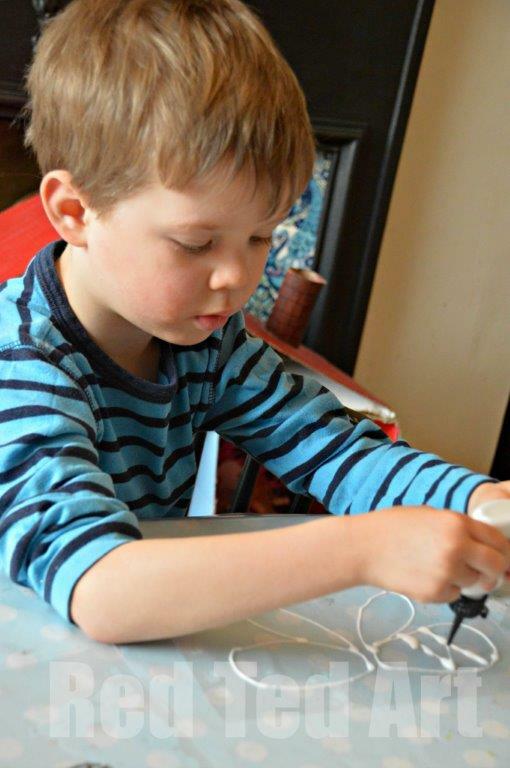 Take a look at our EXTENSIVE list here – so many fabulous ideas. 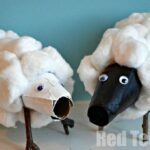 Nothing quite like loo roll crafts, right?! 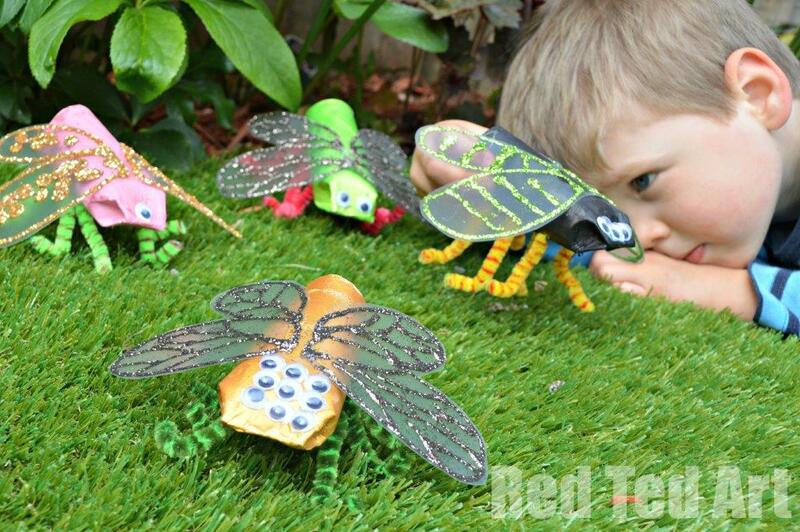 Love your Minibeasts! TP rolls are so great to work with. You can never run out of ideas. It does amaze me quite how versatile they are! I LOVE the mini beasts, have pinned 🙂 What paper did you use for the wings? 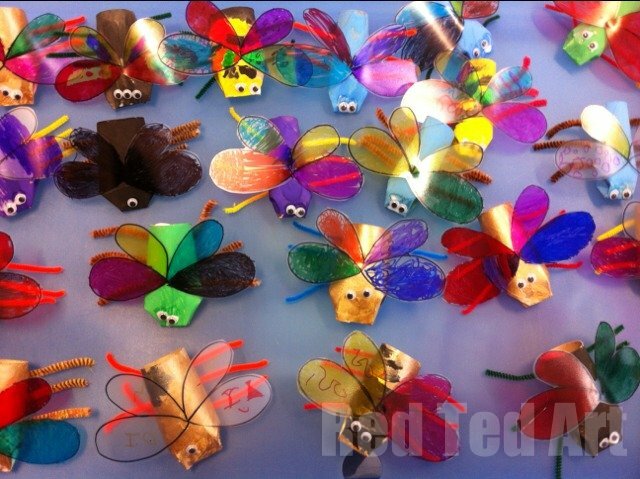 I used acetate for the Tinkerbell wings – you know like you get for overhead projectors at school? And plastic subject dividers for the minibeast wings. You could also use those “plastic folders” that people use for paper work? Can you use Kitchen Paper Towel Rolls and cut them in half? Those are my over “cardtube rolls” go toos.. So cute… love the wings!!! Tried these with my kids over the weekend and they turned out really well. Only problem was that I used glitter glue for the wings and once it was dry it lifted off the acetate. I just glued it back down with clear glue but it does open up some new opportunities if you could somehow strengthen they a bit??? These are SO adorable!! You have the best craft ideas ever!